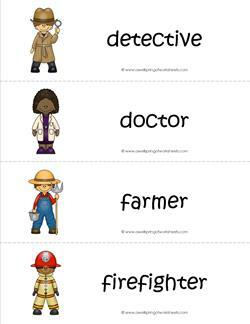 These community helpers vocabulary cards are a great choice to fit in a pocket chart. Use one for a lesson about a particular helper or put them all out for kids to familiarize themselves with all the helpers. There are 24 helpers. I’ve included 8 community buildings and 4 vehicles in this set. Kids can read the words on the cards, match the buildings and vehicles to the appropriate helper and match helpers that might work together in the same building or drive in the same vehicle. Don't take these helpers for granted! Their work is essential. 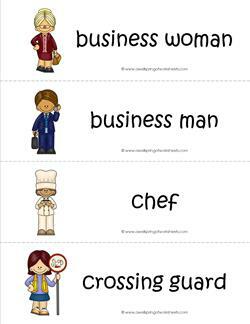 And they are: a business woman, a business man, a chef and a crossing guard. Move over Mr.President! We have some really important folks here who contribute to our community: a detective, a doctor, a farmer, and a firefighter. Here are 2 helpers that spend time on their feet, and 2 that spend time at the water. 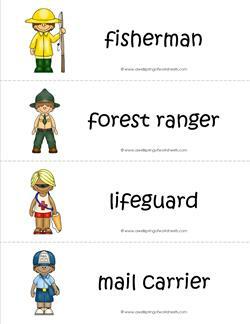 They are: a fisherman, a forest ranger, a lifeguard, and a mail carrier. I think the nurse is perfectly placed on this page. The mechanic, miner, & oil worker use heavy machinery & tools & might get injured and need her help! 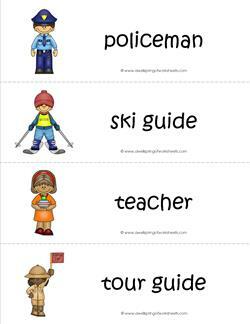 Sure to lend you a hand in the neighborhood, classroom on the slopes or vacation, these folks are: a policeman, a teacher, a ski guide, and a tour guide. 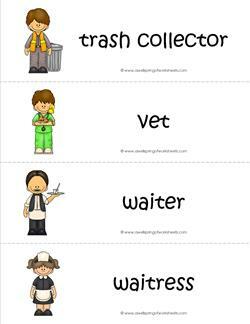 The community helpers on this card are a trash collector, a vet, a waiter, and a waitress. Next time you see them give them a big "thank you" for their service. 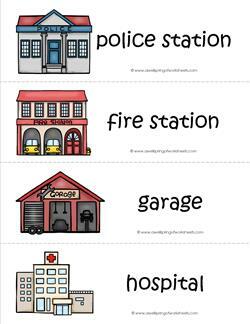 Here are a few buildings in your community: a police station, a fire station, a garage, and a hospital. 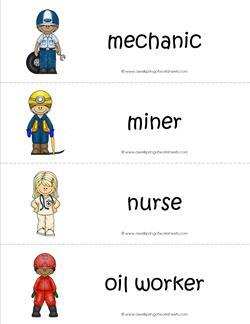 Which community helpers work at each one? There are plenty of these establishments in my neighborhood, how about yours? 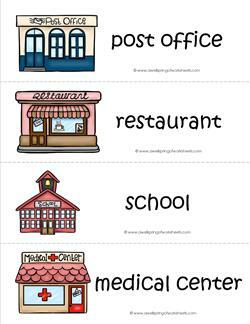 They are: a post office, a restaurant, a school, and a medical center. This page is the odd man out. The odd man in I should say. It has cars in the community. 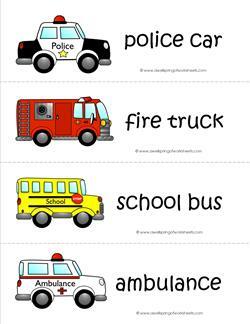 They are: a police car, a fire truck, a school bus, and an ambulance.